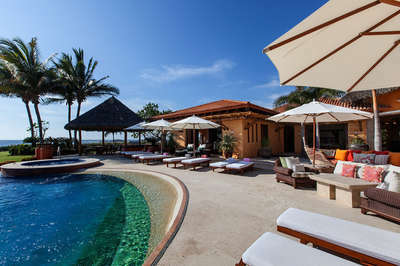 Estate Pavo Real is a fantastic and exotic luxury beachfront estate on the exclusive beach of Ranchos Estates within the renown Punta Mita Resort. Experience the splendor of Pacific Mexican architecture at its very best. Estate Pavo Real is a sprawling garden of meandering trellis within lush tropical greenery and flora under soaring palapas. Rich interior decor send you far away to Asia and India under the Mexican shade. Inquire for more information about rates. Cook services for breakfast and lunch. Residents membership - gives access to Residents Beach Club. Preferential tee times and a special green fee rate for the Pacifico Golf course.